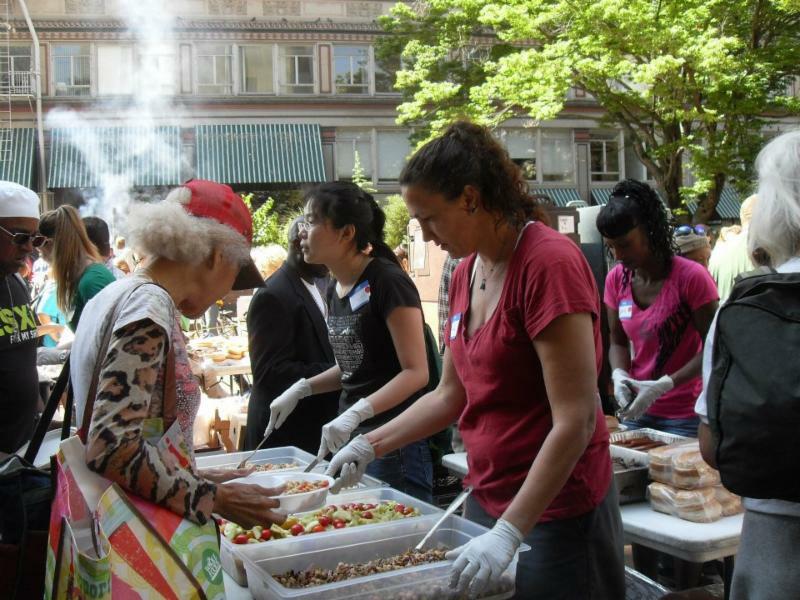 ​Potluck in the Park serves hot meals to those in need EVERY Sunday from 3 pm to 5 pm at O'bryant Square Park (recent location has been moved to under the Hawthorne Bridge due to parking renovation). Since the Potluck's creation in 1991 there hasn't been a single Sunday that's been missed (that's nearly three decades)! As a community, it is imperative that everyone within the community is taken account of and is cared for, and therefore the hunger of our most vulnerable community-members can't go unnoticed. For this reason, Potluck in the Park dedicates its service to those in need of food, a bare necessity for life, with compassion and dignity. 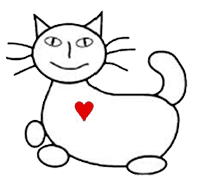 The "mascot" of the Potluck in the Park is a smiling cat which was originally used in "hobo signs" to designate a reliable and hospitable person (usually a woman) who would entertain guests as well as offer a free meal. Location: (until February) under the SW Hawthorne Bridge, (usual) O'Bryant Sq. Park, 808 SW Stark St.
Procedure: Get a meal-ticket and wait for your number-group to be called, then go through the line, and then enjoy your meal! My experience at Potluck in the Park has definitely taught me a few things. 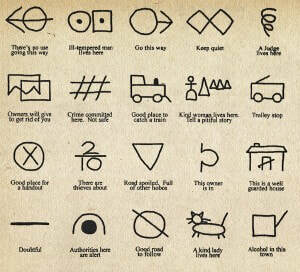 To begin with, I've come to better understand the economic situation of my fellow Portlanders. I was aware of the massive issue regarding those experiencing homelessness, but I was unaware of the borderline poverty that a lot of financially insecure (but not homeless) Portlanders have to face on a daily basis. This has certainly opened my eyes to my local community, and has made me more cognizant of the material conditions of my immediate surroundings. Also, I've learned that I am capable of micro-managing people in small-group situations. Due to the fact that the Potluck in the Park isn't always fully staffed (it's all run by volunteers, so how many people show up can vary) it can get pretty hectic. In this more "chaotic" scenario, where one has to improvise and think on one's feet, I've been able to succinctly act and help others understand what they need to be doing. If you are free on Sunday from 3 pm to 5 pm then try signing up to volunteer through ​https://www.handsonportland.org/ as either a Clean-up Crew Member or a Food Service Member. If you can't go all the way as regards volunteering, that's ok! You can also donate food (purchased from the grocery store or a restaurant, home-baked goods without perishable fillings, as well as uncut fresh fruits and veggies) which is always appreciated (and needed)!